Dried Fungi boletus-shiitake-champignon mixed Dolomites 200 gr. Buy now this product together with Smoked chamoix sausages "Gamswurze" Bernardi app. 300 gr. ready for shipment: in stock Smoked chamoix sausages "Gamswurze" Bernardi app. 300 gr. Buy now this product together with Dried Fungi Boletus Dolomites 100 gr. Dried Fungi Boletus Dolomites 100 gr. ready for shipment: in stock Dried Fungi Boletus Dolomites 100 gr. Belly bacon butchery Hell, spicy strong bacon, ham, at least 5 months stored, hand made. Black Currant jam fruit spread Horvat Bruneck. Made after Grandmother's recipe with the finest fruits controlled cultivation. Fruit portion 50 gr. on 100 gr. Finished product. Dried Fungi Boletus Dolomites 100 gr. 20,75 EUR / 20,75 €/100 gr. Dried Fungi Boletus Dolomites 50 gr. 11,55 EUR / 23,10 €/100 gr. 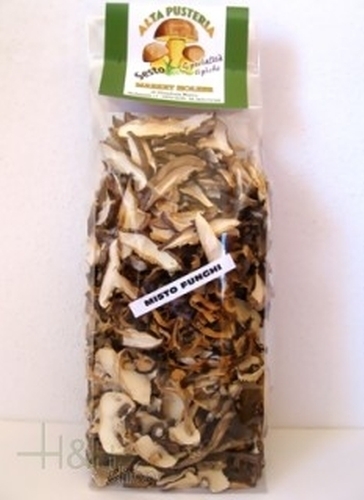 Dried Fungi boletus-shiitake-champignon mixed Dolomites 100 gr. 14,35 EUR / 14,35 €/100 gr. Dried Fungi boletus-shiitake-champignon mixed Dolomites 200 gr. 25,50 EUR / 12,75 €/100 gr.